Land form Scavenger Hunt and Play-Doh Maps. 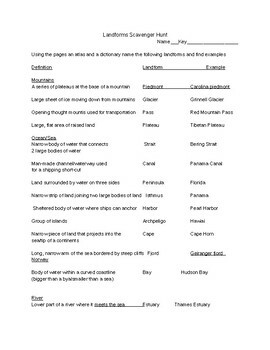 This lesson has students use any atlas, dictionary, or electronic device to figure out the words that go with the definitions. Once they find all the words students should be placed into pairs or groups to create their own new countries/lands. They should use as many land forms as possible on their maps. Once the students create a rough draft they need to create a neat final draft of their maps on a heavier weight paper. 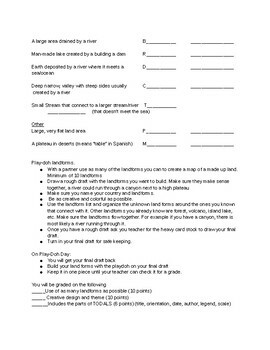 I have found when using this in my own classroom the play-doh will stick to the paper, so wax paper might be a good idea to lay over the final draft so students can create their play-doh land forms. Use any part of this lesson to fit your needs. It will take 2-4 50 minute class periods. 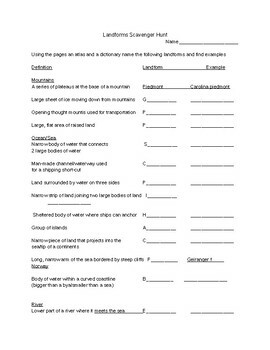 I have also used the final maps and play-doh as an assessment for basic land form knowledge. 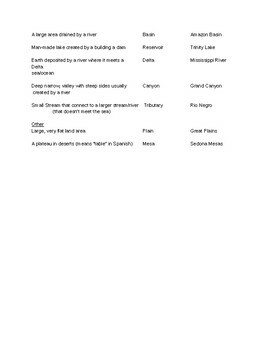 I have paired this with the create a map and story project as a final step.